::: COHME's Weequahic Park #HouseMusic Festival - THIS SAT 6/20 join DJs Adam Cruz, Tony Humphries & more! 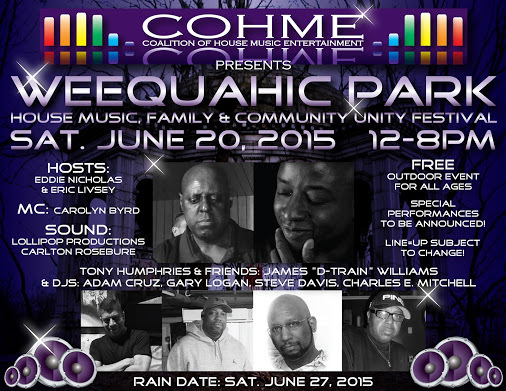 COHME's Weequahic Park #HouseMusic Festival - THIS SAT 6/20 join DJs Adam Cruz, Tony Humphries & more! House music lovers most likely have placed a circle around Saturday on their calendar. That's when the Fifth Annual Weequahic Park House Music Family and Community Festival will be held in Newark to kick off the start of summer. The event, which is sponsored by the Coalition of House Music Entertainment, is from noon to 8 p.m. and features several DJ's and performances from groups such as D-Train. On the turntables, house heads will groove to sounds provided by DJs Tony Humphries, Adam Cruz, Gary Logan, Steve Davis and Charles Mitchell, who started the festival to do something positive for the community. Mitchell, a Newark native, said the festival is a peaceful gathering of families, friends and a mature audience of house music fans celebrating life through dance. Each year the festival attracts thousands and Mitchell expects the same on Saturday. There will be vendors, food, and activities for children. He said the coalition is honoring Humphries for his contributions to the music. His organization is also recognizing Essex County Executive Joseph DiVincenzo and Park Director Dan Salvante for their support of the event since it started. "Without them, this wouldn't happen,'' he said.